The Samrat Yantra, sometimes called “Supreme Instrument” is an equinoctial sundial of enormous proportion. Although one of the simpler instruments, and not too different from sundials which had been developed hundreds of years earlier, the Samrat Yantra is important because it measures time to a precision that had never before been achieved. The Samrat Yantra at Jaipur, for example, is capable of measuring time to an accuracy of two seconds. The essential parts of the Samrat Yantra are the gnomon, a triangular wall with its hypotenuse parallel to earth’s axis, and a pair of quadrants on either side, lying parallel to the plane of the equator. On a clear day, as the sun passes from east to west, the shadow of the gnomon falls on the scale of the quadrant, indicating local time. You can see this illustrated in the time-lapse video below. Since a sundial gives the exact time for its particular locality only, a formula to obtain standard time is used that compensates for the longitude difference between the instrument location and its time zone, and the daily adjustment that must be made due to the earth’s orbit around the sun. 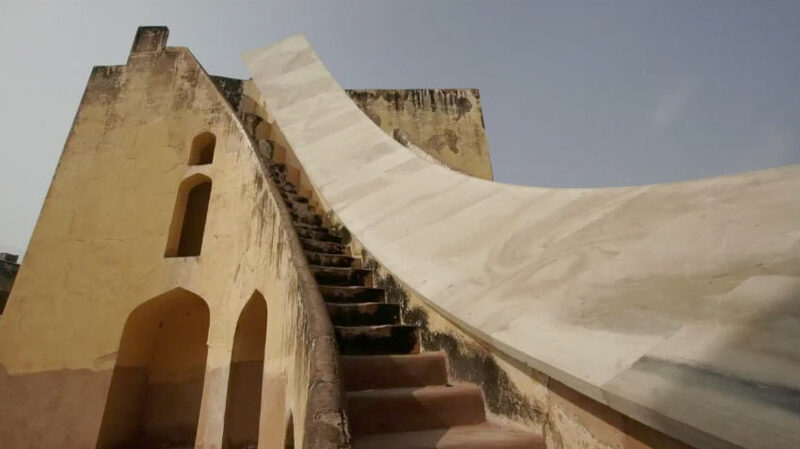 Time lapse video - approximately one hour in the early afternoon on the eastern quadrant of the Samrat Yantra at Jaipur. The largest sundials are capable of extremely precise measurements of time by means of a special way of “reading” the shadow of the gnomon. One of the common criticisms of the Samrat Yantra’s claim to precision is that because of the distance of the edge of the gnomon from the quadrant scale, its shadow has a soft edge. This means that although the surface of the quadrant is inscribed with fine markings to indicate 2 second time intervals, the soft edge of the shadow may span 6-7 of these marks and the center of the shadow can only be estimated. The solution is to hold a thin object such as a twig or taut string parallel to the shadow edge and about a cm above the quadrant surface. Moving the rod into and out of the shadow, and noting the spot on the surface where its shadow disappears, gives an exact indication of the center of the shadow. Eastern quadrant of the Samrat Yantra at the Jaipur Observatory, from the upper part of the quadrant. 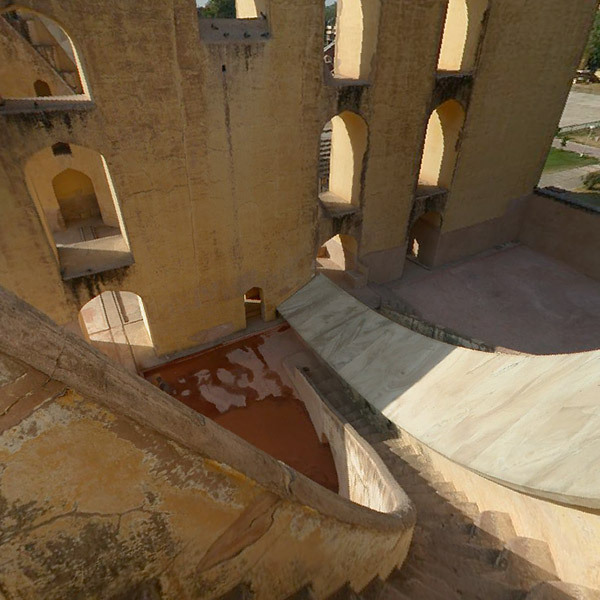 Time lapse video - approximately 20 minutes on the western quadrant of the Samrat Yantra at Jaipur (late morning). For best viewing choose fullscreen mode at lower right of video control bar. Time lapse video - approximately 20 minutes on the western quadrant of the Samrat Yantra at Jaipur (late morning).